Ergonomical injection molded Plastic enclosure. Use of standard PC 101/PS2 Keyboard for programming. Emphasis on Hardware troubleshooting through on board short links. Exhaustive Didactic Courseware. Critical & delicate ICs are protected under acrylic cover from below. All in one Logical IO® Monitor design Supports both serial IO & Keyboard display console IO. - based on 8085 cpu operating at 6. 144 mhz crystal frequency. - 8k bytes of eprom loaded with powerful monitor program. - total on board memory expansion upto 64k bytes using 2732/2764/27128/6264/ 62256 with 1 socket of 28 pin. 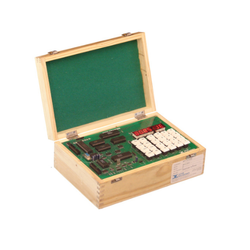 8085 microprocessor training kit with inbuilt power supply. Total on board memory expansion upto 64K bytes using 2732/2764/27128/6264/ 62256 with 1 socket of 28 pin. Battery back up for RAM with 3.6V rechangeable cell. In order to keep pace with the never ending demands of customers, we are involved into offering wide range of Microprocessor Trainer Kit. Our firm is engaged in providing a wide series of Microprocessor Lab Instrument. To attain the maximum purchaser satisfaction, professionals develop these products in diverse configurations that meet on customers demand. Additionally, we present this product to our patrons within the given time at reasonable prices. 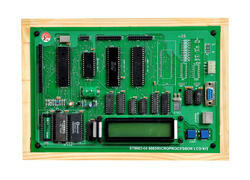 43211 is a single board Microprocessor Trainer Kit based on 16 bit 8086 Microprocessor, which is widely used to train engineers to develop software/hardware for any industrial process & control.This Kit consists of power-full Monitor EPROM, RAM, I/O Lines, Timer/Counter, Serial, Seven Segment Display and Keyboard for Man to Machine Interface.Features. To meet the necessities and necessities of the clients, we are providing a quality series of Electric Microprocessor Trainer.